A good roof should last 20 to 25 years, which means it is a long-term investment you shouldn’t take lightly. 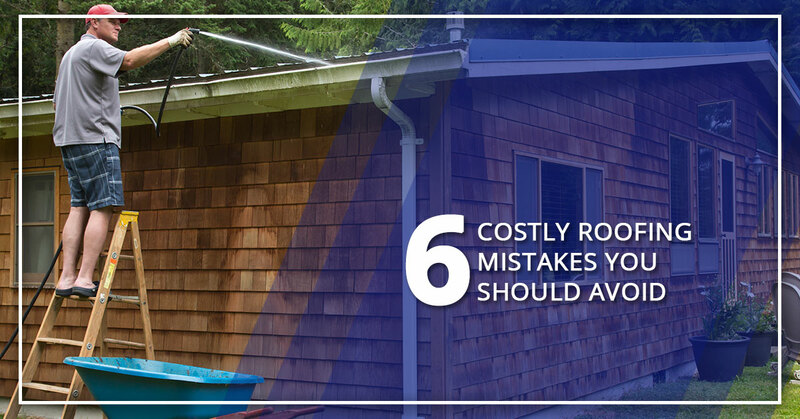 We’ve gathered some of the most costly roofing mistakes you can make so you can get the most out of your new roof as possible. When you don’t do your due diligence when getting a new roof, it can be dangerous and expensive and you’ll end up with a cut-rate roof over your head. If you’re in need of roofing repair or replacement you can trust, count on SAFG Inc. We’ll get the job done right! When you’re getting your roof repaired or replaced, it’s a big investment that carries a big price tag. That sticker shock can make some homeowners want to go with cheaper options, but even though that initial price might be lower, it’ll cost you much more in the future. While you may not notice the shortcomings of a cheap roof at first, all it takes is one bad storm to make it clear how bad it really is. At that point, you put your family’s safety in danger. Attempting to repair a roof when it really needs to be replaced is another example of cutting corners, as it’s like putting a bandage on a far worse problem. It may fix it temporarily, but there is a deeper issue that needs to be addressed. When a contractor gets their shingles from more than one manufacturer, they are much more likely to be different shades or different colors. That’s because manufacturers produce shingles in batches to maintain their uniformity. When you don’t get shingles from the same manufacturer, your roof will have a patchwork appearance that severely affects your home’s curb appeal. This is incredibly important to keep in mind when repairing your roof, as you’ll want to get shingles that match to avoid a mismatched, patchy look. Any time you have a construction project, it’s imperative you get the proper permits. Without permits, you could be forced to tear your new roof off, pay expensive fines, and/or your insurance company may not cover the project. Paying the small fee for a permit will end up saving you money and headaches down the line, so it’s silly to not do it. The best roofing companies will always take out the right building permits so that your job is compliant with all regulations, so you shouldn’t even have to do this step yourself. As you probably remember from science class, hot air rises. In your home, you have heat accumulating from appliances, HVAC systems, and body heat from everyone in the house. As that heat rises, it naturally needs somewhere to go. Without proper ventilation in ceilings and attics, that heat rises, gets trapped, and results in moisture that can cause your shingles to break down. That moisture can also cause harmful mold to develop, causing your insulation to be ruined. Your energy bills will skyrocket as the temperatures will be more difficult to control without an increase in effort from your air conditioning and heating system. A house needs to be able to breathe in order to preserve comfort and energy efficiency. With proper venting, you’ll save money and extend the lifespan of your new roof. While it may seem like the most efficient way to clean a roof, a pressure washer will cause the shingles to lose integrity and they will break down. The shingles will have a more tenuous connection to the roof, which will result in shingles falling off, which leaves your roof defenseless to the weather it’s designed to protect you from. All it takes is one intense power washing session to cause serious damage to your roof, so it is never recommended. Even if the first time you pressure wash it there isn’t any noticeable damage, that damage builds up and continuously weakens the integrity of the roof. If you want to clean your roof safely, contact a roofing contractor to discuss what your options are for cleaning it. As each roof is different, there may be a different treatment required to clean it effectively. We’ve seen it happen more than it should. After a big storm causes a lot of damage, a fly-by-night company swoops in to do the repairs cheaply, and they end up making the situation worse. Because they aren’t certified or insured, you’re left holding the bill with no recourse. Not only will this leave you with a dangerous roof over your head, it all but guarantees a much higher bill in the future to repair or replace what had been done incorrectly or haphazardly. Don’t fall into this trap! Ask for references, and check the company’s certifications, bonding, and insurance paperwork. Doing a little bit of extra legwork will save you time, money, and stress in the long run. Getting a new roof can be stressful and costly, but as long as you avoid these common mistakes, you’ll be in a much better position for the future. This will ensure you get a roof you can feel safe under for decades to come. The alternative is dangerous and will cost you more in the long run, so you’re better off doing a little bit of extra research to ensure you get the service you need. If you’re in the metro Atlanta area and you’re in need of roof repair or replacement, call SAFG Inc. today. We’ll be happy to detail all of our services and qualifications to give you peace of mind. Our experienced roofing team will get the job done right so you can rest easy. We hope to hear from you soon!